The top prize for the 2016 Nitehawk Shorts Festival went to the very short that opened the festival: the odd, wistful and funny VEGAS directed by New York filmmaker Saj Pothiawala. 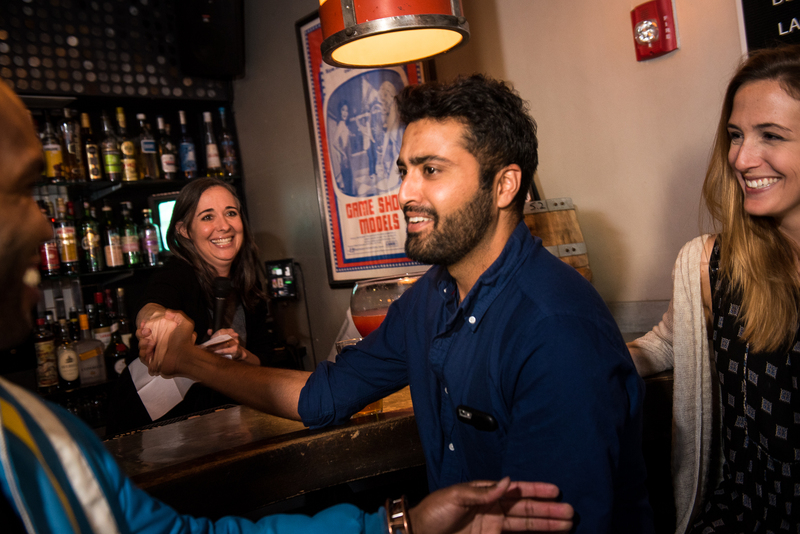 We caught up with Saj, still caught in the glow of his win, at the Shorts Fest after party and talked the late night inspiration for the short, modern dating, loneliness and his plans for his prize post-production package from Heard City and Nice Shoes. Nitehawk: Tell us about your short. Saj Pothiawala: It’s called Vegas and it’s about a man who gets stood up on an online date, and on his way home he encounters an eccentric prostitute at a bus stop, and he makes the decision to solicit her. NH: I mean she’s more than eccentric, she’s a cosplay prostitute. SP: Yeah, she’s a cosplay prostitute. NH: What made you want to make her a cosplay prostitute? Was it like a commentary on nerd culture or was it based on something that actually happened? SP: I think any time you pick a unique theme or take on something, because everyone has seen a movie about a prostitute before, if you pick something that’s a little bit more unique, then you by necessity have to figure out what those implications are. I guess I worked backwards in that way, because there was an incident five-six years ago, I remember I was on the subway late at night, like 23rd street in Manhattan, and there was a woman in a tight pink latex jump suit and a blonde white wig and this crazy David Bowie make-up. And I heard these big platform shoes click down the platform, stop every pillar or so, lean against it, and she would continue on her way until she sat down on the benches next to me. It’s one of those moments that happen in New York City when you’re alone in a place with a stranger. So I wrote down that scene, because I thought it would be really funny if you extended an olive branch to this person and if that kind of innocence and sweetness was undercut by a solicitation from a prostitute. When you look in the film, when she approaches him, it’s kind of presented very innocently, it’s sort of, for lack of a better word, it’s a ‘meet-cute.’ It’s a meet-cute turned on its head. NH: How did the project go from train platform to short film – excuse me – award winning short film? SP: *laughs* Let’s not go too far. Let’s see, I was looking to make something because I was in a place in my life where I was feeling kind of creatively stuck. I had done a lot of sketch comedy stuff before, and I felt like I wanted to make something that communicated how I was feeling at the time. I had just gone through a break up with someone who I was with for four years, my father passed away the year before, so in that moment, if you go through any sort of loss, whether it’s a break up or grief, what you feel more than anything is loneliness. Not just anger and not just depression, but you just feel lonely. I was trying to make something that communicated that. There’s a lot of different themes floating around, none of it intentional, it’s just internet dating is an easy vehicle to tell the story. NH: Do you have a lot of experience with internet dating? SP: As much experience as any other twenty or thirty year old. It’s the dating paradigm now. You’re single, you go on Tinder, you go on a couple dates and you get sick of it and you hate it because I think it’s so easy to treat people disposably. NH: Do you feel it’s impersonal? SP: I don’t know if I would describe it as impersonal, I think it can be. Dating is one of those things in life where you’re taught to be empathetic and to be friendly to everybody, but I think dating is one of those things in life where you’re within your rights to not be friendly with somebody. I think there’s a fine line between treating people with respect and not, when that’s the case. NH: Is this your first short? SP: This is my first short film. I’ve directed a lot of comedy pieces that are a little less ambitious, I guess. In writing the script and working on it, the rhythms of joke telling and jokes I can get down. What I was most concerned about was making it feel like a more complete story and that more was being said there. Like with anything else you make in life, if you’re creative, there’s always things you watch like ‘I wish I did this or that,’ but for the most part I feel pretty proud of what I made, even though I am in a different place mentally than I was when I made it. NH: Are you going to do another one, or are you going to do a feature? SP: I guess I gotta do one now, they gave me 35-grand in post-production *laughs*. I have a couple of feature ideas floating around. I don’t think Vegas is a feature, but if some producer asked “is this a feature,” I would say yes! *laughs* “Yeah, yes sir. You got it!” I’m working on a TV pilot, I made a pilot with some friends that was at Comedy Central for a little while, TV is really where I want to go towards because I think that’s more my speed and what, I guess I’m good at. I love directing but I love writing more, and I have friends who are really talented directors. You’ve got to think about if you have a story to tell what’s the best way to tell it, and the best way to make it. Maybe a short film is the best way to tell the next story, I don’t know. SP: Thank you, I hope I didn’t say anything too terrible.